Sit on a chair or bench and place one dumbbell on each knee. Kick the dumbbells up with your knees, one at a time, and position them in front of your shoulders, with your elbows tucked into your body. Your elbows should be directly below your wrists and your palms should be facing each other (i.e. parallel or neutral grip). Keeping your body still, exhale as you press one dumbbell upward, over your head, until your arm is almost fully extended. Keep alternating the arm that you press overhead. Keeping your elbows tucked into your body emphasizes your anterior deltoid and upper pectoralis major and reduces the contribution of your lateral deltoid. What’s more, it eliminates the contribution of your supraspinatus. Pressing one arm at a time puts your body out of balance, which forces the recruitment of stabilizer muscles in your core, such as your obliques, psoas major, iliocastalis lumborum, and iliocastalis thoracis. The seated position keeps your body still and prevents you from cheating by using your legs to generate lift. 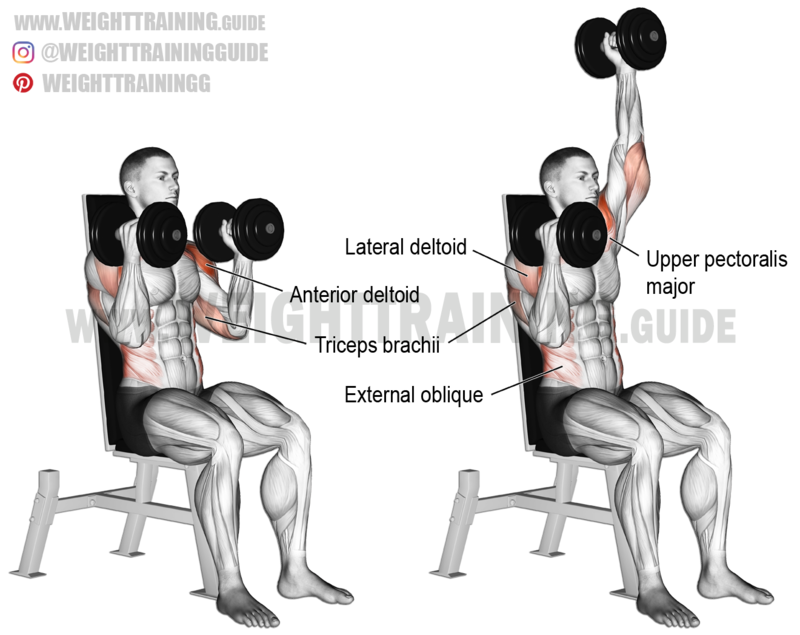 This is the closest video I could find to the seated elbows-in alternating dumbbell overhead press. The elbows should be tucked in more and, of course, the arms should be alternated. Thank you ever so much for you post. I have pain in my shoulder and alternative and variation shoulder exercises like this one are useful to me to try.